Sian Dellar | Cheat your way to thick, fluttery lashes! If your lashes are naturally sparse or you have lighter hair, you may rely on mascara to add definition to your eyes and fullness to your lashes. 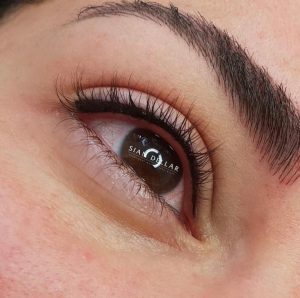 However, if you envy those with thick, dark lashes that always manage to look somewhat put together when going makeup free, then consider a semi-permanent eyeliner treatment. While the treatment can be used to create bold flicks and a lined look, if it’s natural definition and full looking lashes that you’re after, then pigment can be applied in between the lashes, creating the illusion of darker, fluttery lashes and giving a permanently defined look to your eyes. Available here at Sian Dellar, Sian will work with you to find the perfect shade for your eyes and tailor the treatment specifically to you, taking into account your lifestyle and makeup routine/style to ensure she creates the best possible result for you. The results usually last between 6-12 months before requiring a top-up, making it a brilliant option for those that hate wearing mascara or find themselves in a rush each morning. Prices start from £395.00// Available at Sian Dellar’s Harley Street Clinic in London //.